Excited as heck to get back to NYC, and with only 8 days to see “everyone”, we decided to put the brakes on our Retail Arbitraging. Well, that’s easier said than done. Because after a nice lunch with my godparents at Jackson Hole on the UES, we were walking down 5th Ave and from a distance a glaring orange sign caught my eye. And it was none other than a Home Depot on 5th Ave. Seriously? With all the chaos of the City, who would figure that a huge hardware store like Home Depot would be located there? So, of course it took a bit of convincing but I got Nessa to come join me on a little Home Depot NYC recon. Before I jump into our experience, let me cover some of the objections one may have to Tragin’ on the road. We are traveling. JUST enjoy the travel. It’s NYC! It’s so busy and will be overwhelming. We just ate a nice meal. Let’s walk it off a bit, while Tragin’. Plus, NYC is EXPENSIVE, so let’s offset the financial capitulation a bit. Hardware-shmardware. There are UPS stores on every other corner of the street. We don’t need to walk very far to drop off our shipment. Not to mention the fact that cabs are a viable option. And printing off shipping labels isn’t an issue because you can send shipping labels to be printed at the UPS store through the UPS app. Lastly, packaging all of this stuff is easy. We’re hitting a Home Depot which has the essential boxes and packing tape. Contingent that we find something. People say if you can be successful in NYC, than you can be successful anywhere. Hmm, hmmm…What do you have to say about that? Did I mention that NYC is bleeding us dry of cash? Good, so let’s make some of that cash back. Once these objections were overcome, we ran into the store like it was FAO Schwartz or something. (R.I.P.) Making our way around this spectacle of a store, we checked out the showroom on the middle floor and made our way to the ground floor. And that’s where all the merchandise was. Honestly, it kind of felt like we were in an Ace Hardware and not so much a Home Depot. After scouring the aisles and not really finding anything, we struck the clearance jackpot. Or so we thought. Because this one little nook was where the store kept all of its clearance product. We did our initial scan looking for products that we have already bought in the past and we didn’t find anything. Then, we turned to price labels with 50% off and up. And voila, we found a filter jackpot! Yes, there were about 20 water filters on clearance, all selling for about $10 and had been selling around $30-$40 before going on clearance. After scanning the products we quickly realized that not only did these products have really great ranks but they were selling for even more than the normal retail price at Home Depot. So, we bought every filter that was in new condition, made our way to the storage aisle to buy a small heavy duty box and a roll of packing tape. And like that, we had what we would call an ideal NYC arbitrage run. After our store run, we stopped back at the AirBNB spot that we were renting, logged into the Wi-Fi, prepared the shipment and sent the shipping label to the local UPS store using our UPS account. Once we walked over to the UPS store, we printed off the shipping label, taped it to the box and got our shipping receipt. Easy, peasy, lemon-squeezy. In only a couple of hours we had made our first NYC arbitrage run and we didn’t have any of the comforts of home. That should go to show you that Retail Arbitrage isn’t really such a difficult way to make a fun living. 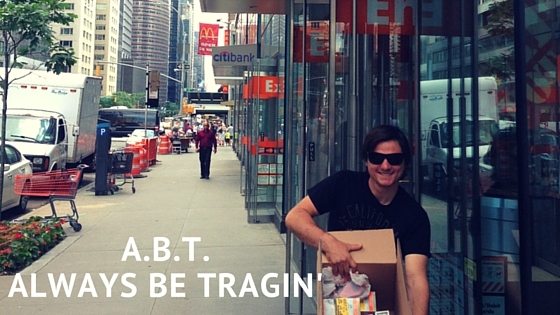 What fun would this article be if we didn’t share the profitability of our NYC arbitrage run? Exactly! That’s why I’m going to share with you how much each unit cost, how many units of each we bought, what we sold, the selling price and profitability. But first, let me give you a little time line. Now that you know where we are at, let’s take a look at the breakdown. Looks pretty good for only a few weeks on Amazon, huh? We think so. Pulling some of the numbers from the chart above, let’s look at the big picture. As it stands, our ROI is 94%. And once all units are sold, our ROI will be 209%!! !